This guide is in its nineteenth edition but now published by Wiley Nautical. It has become over the years a highly regarded work and is presented in the Wiley house style for its cruising companion series. Wiley Nautical has been expanding and updating its excellent range of cruising companions. This guide is in its nineteenth edition but now published by Wiley Nautical. It has become over the years a highly regarded work and is presented in the Wiley house style for its cruising companion series. As such, it is much more than just a navigation aid to sailors. It includes a wealth of detail about the land areas around the navigable waters it covers. For anyone intending to navigate along the English East Coat, this book is an essential guide. It is also a very effective guide to those who want to learn more of the area from a distance or who may wish to tour the land around the waterways. In view of the deserved high reputation of this book, it may seem churlish to include criticism. There is one way in which this work has a potential defect and it may be more in the title than in the content. Every cruising companion has to have boundaries to the areas it covers. In this case, the boundaries run from the port of Lowestoft to the Channel port of Ramsgate, and from the port approaches to typical navigable waterways for keel boats with significant airdraft. The English East Coast stretches South from the border with Scotland, to the Thames Estuary. The popular view of East Anglia is that it stretches from the Wash to the Thames. In either case, this book covers much less of the East Coast and then adds Ramsgate which is not generally regarded as being part of the East Coast. The most significant omission is of the River Yare at Great Yarmouth, which opens the Broads network of lakes and rivers from the sea and also connects to Lowestoft via Mutford Lock and Lake Lothing. The failure of planners to pay adequate attention to the needs of sailors has resulted in fixed bridges that deny access to boats with high masts and a failure by the Broads Authority to adequately maintain waterways in the Broads network has denied access to boat with drafts of more than four metres. 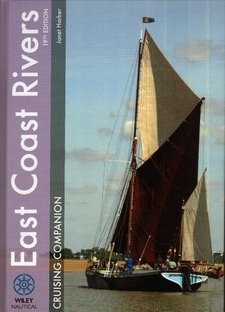 However, many sailors will be able to navigate along the East Coast and access the rivers, travelling some distance inland, and beyond the points shown in this book. For a book which contains so much value, it might have been helpful to add a subtitle showing that is covers the English East Coast from Lowestoft to Ramsgate.